It’s that horrible dilemma that every writer hears about over and over and over again… SHOW, DON’T TELL. The problem is that it isn’t always that easy to do. 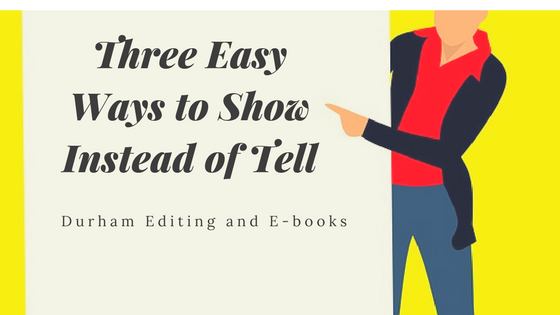 Today we’d like to share with you three quick-and-easy ways to show the reader without having to come right out and tell the reader. Here goes…. 1. Use words that evoke a recognizable image in the reader’s mind. Let’s say that you have a character who is really manly, a true man’s man. You could come right out and tell the reader “Bob is a hard-working man who works 60 hours a week.” There are worse ways you could say it, but there is also a better way that you can show it. What is a quick and easy way to show the reader instead of tell the reader? Use words that evoke a recognizable image in the reader’s mind. What do we mean by that? Let’s take a look at how using a recognizable image easily evokes a picture in the reader’s mind without much work on your part and without having to come out and tell the reader things that could be shown. – Bob’s calloused hand grabbed the gun. – Bob’s well-manicured hand grabbed the gun. In the first sentence, the image of a calloused hand immediately evokes the image of a hard-working man. At the same time, the well-manicured hand of the second sentence makes the reader think that Bob has probably never done a day’s work in his life. By using words that evoke a recognizable image in the reader’s mind, you show the reader a great deal about the character without going into great detail. 2. Add actions and reactions to dialogue to show the meaning behind the words. Instead, we’ll use the actions or reactions of the character to show the reader the meaning behind the lines instead of tell them. See just how much these words can change based on the actions/reactions included with them. – “You are the worst teacher I ever had,” Jan said jovially as she slapped Rita on the back. In each scene, the words mean slightly different things based on the action/reaction Jan has. On a side note: Another common mistake we see is when writers have a long spanse of dialogue without any actions or reactions to accompany the words being said. By adding in the physical side of the scene, it helps bring the words to life and shows the reader not only what is going on in the scene but a good bit about the character, as well. Strong verb usage is, perhaps, one of the best and easiest habits to help you show the reader and not tell the reader. Look for a verb that creates an image. If your character walks across a room, that’s okay. But what if that character is not just walking? Sometimes using a stronger verb can give insight into the character and the action. Look at these examples. – Bob was in a hurry when he walked up the steps. – Bob bounded up the steps. The second example shows the reader what the first example is trying to tell the reader. By using the stronger verb, the reader is able to get a picture of what’s going on without having to tell that the character was in a hurry. Many writers fall into a trap of thinking that it requires writing too much extraneous information to show the reader what is happening rather than telling the reader what is happening. By using strong verbs, you can circumvent that dilemma. Look at the next two examples. – John moved quickly and hurriedly across the open expanse of land. – John scuttled across the open expanse of land. The reader gets the same idea that John is moving in a hurry by using the verb “scuttled” without having to say that he is moving in a hurry. This will help you to be more specific and give characterization without using too many extraneous adverbs.